These pampering treatments are all about eyes. Our Deep Hydration Firming Eye Serum and Revitalizing Eye Mask combine Okinawa Red Algae, Honeysuckle Leaf and Caffeine to visibly plump, firm and de-puff the eye area. The Revitalizing Eye Cream contains Peony and Honeysuckle to energize skin and visibly diminish fine lines and dark circles. The included silk sleep mask promotes restorative rest. - AGELESS Revitalizing Eye Cream Travel Size - 3 ml | 0.1 fl. oz. - LUMINOUS Deep Hydration Firming Eye Serum - 15 ml / 0.5 ﬂ.oz. My eye contour needs all the help it can get. It dries out so easily. 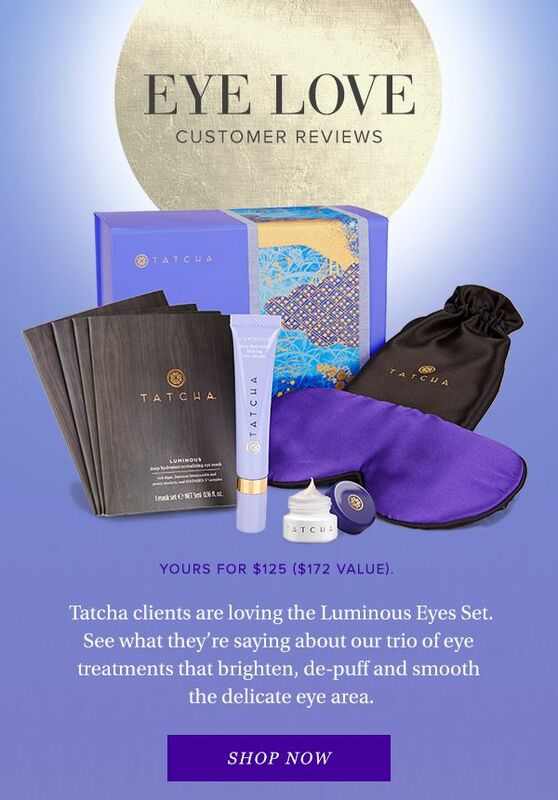 HI Melissa, This TATCHA set definitely would give you all of the moisture that you need– especially now that the weather is starting to cool down. I love their products so much!